Last in the series on Uncle Mike's Beef Jerky is this Barbecue variety. See my previous reviews of their Original and Spicy Hot varieties. 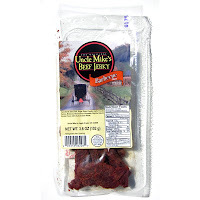 Uncle Mike's Beef Jerky is a brand of Walnut Creek Cheese of Walnut Creek, OH, having been in business since 1977. Walnut Creek Cheese is a popular destination for tourists visiting the Amish Country of Ohio. In 1998, they acquired Uncle Mike's Beef Jerky, and today it's manufactured in Walnut Creek Cheese's own USDA inspected facility. Beef, salt, sugar, onion powder, garlic powder, spices, molasses, monosodium glutamate, paprika, natural smoke flavor, citric acid, sodium nitrite. The first thing I taste from the surface of these pieces is a moderate sweetness, copious amounts of the paprika, and a touches of garlic. The chewing flavor starts with a bit more sweet, a moderate saltiness, noticeable amounts of the liquid smoke, and an increased garlic. There's also a light bit of natural meat flavor. For being labeled as "Barbecue flavor", this does seem to have a barbecue sauce flavor to a light degree, albeit a mild, bland barbecue sauce flavor. It's nothing like the bold, tangy, spicy flavor that you expect in real barbecue sauce. This has mostly a sweet flavor, a light smoky flavor, with some garlic. The other reviews I wrote of Uncle Mike's Original and Spicy Hot varieties also had a barbecue flavor, but more like a barbecue seasoning flavor. The Original has more spiciness, not hot, just more bold and flavorful. The Spicy Hot is comparable to the Original, but with more heat. But this Barbecue variety is the most mild of the three, being more sweet. The natural meat flavors are noticeable to a light degree, and with a fatty flavor mixed in. The level of saltiness in this seems to be a moderate to high level. Overall, what you're going to taste in this is a mild, sweet barbecue sauce flavor, far from the bold, spicy, tangy flavor you might expect from bottled barbecue sauce brands. You'll get a light natural meat flavor, with some smokiness, and a medium to high saltiness. 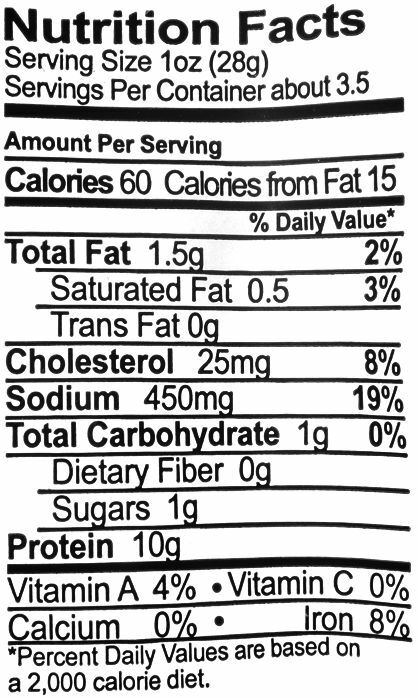 These are slices of whole meat, sliced thick, into strips of varying lengths and widths. This is a semi-moist jerky having a semi-moist surface feel, and a slight oiliness too. These pieces have a good deal of flexibility, with some being able to bend 180 degrees back on itself with little cracking. Biting off chunks seems easy overall. Chewing also seems easy. The chewing texture starts out feeling soft and tender, with some initial chewing resistance. But when chewing, they reveal a more chewier, slightly labored nature. Once chewed down to a soft mass, they feel like a real piece of steak. I see plenty of small bits of fat on these pieces. I don't see any gristle or tendon on these pieces, but several times I found a good deal of chewy, or unchewable wads of tissue. There's also a good deal of stringiness in this. As for clean eating, I can feel a faint bit of oiliness and stickiness on my fingertips, but still quite dry enough to type on my keyboard. There's also a fair amount of meat and seasoning fragments falling on my lap. Walnut Creek Cheese sells this Barbecue beef jerky from its website at a price of $3.99 for a 3.6oz package. I bought six packages in all in different flavors. The shipping costs come out to $13.86, for a grand total of $37.80. That works out to $1.75 per ounce. 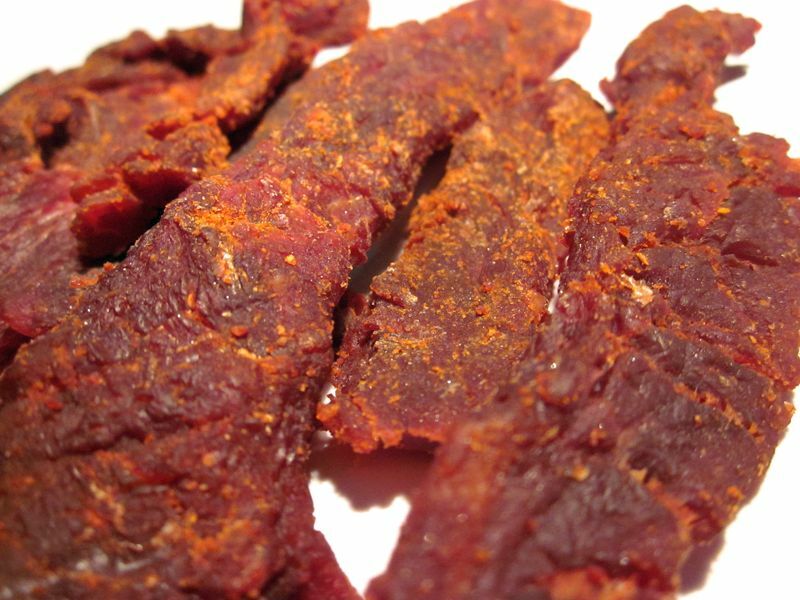 For general jerky snacking purposes at the $1.75 per ounce price, it's a decent value. 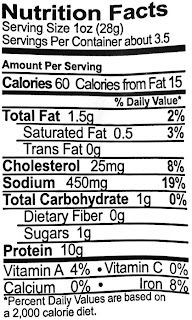 I'm getting an average amount of snackability for an overall satisfactory flavor, decent meat consistency and chewing texture. That price is about the same as what you'll pay for major brands of jerky at grocery stores, and it seems it provides a slightly better snackability. As a Barbecue beef jerky, at the same $1.75 per ounce price, it's also a decent value. It does have a barbecue sauce flavor, but a mild one with no bold, tangy, or spicy flavor, and mostly a lot of sweetness. 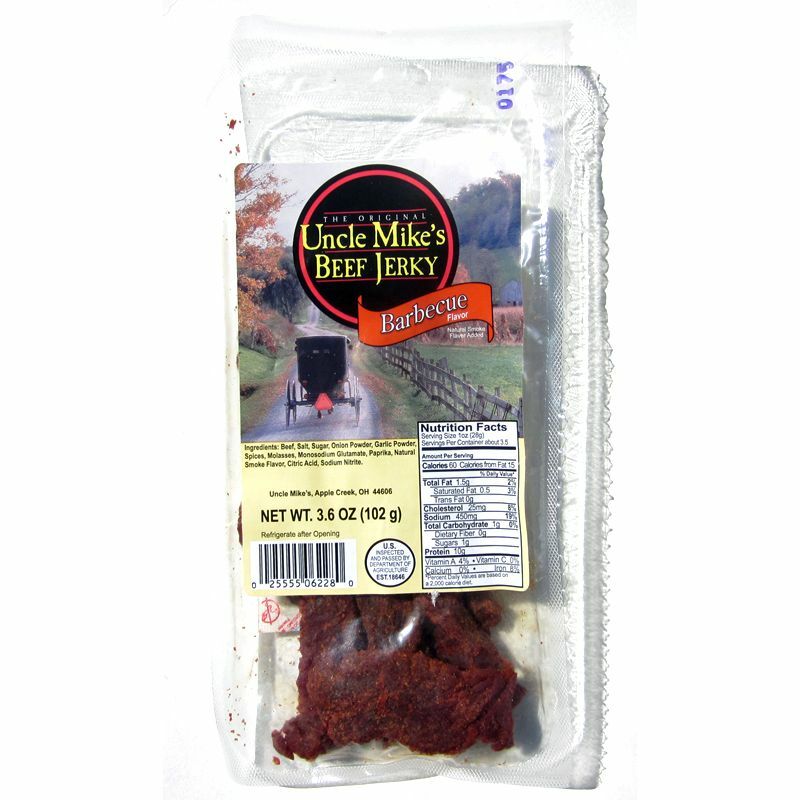 This Barbecue variety from Uncle Mike's Beef Jerky offers a barbecue sauce flavor but one heavier with sweetness, and quite mild. It's not bold, tangy or spicy like you'd expect to get from a bottle of barbecue sauce. But it still manages to resemble barbecue sauce. 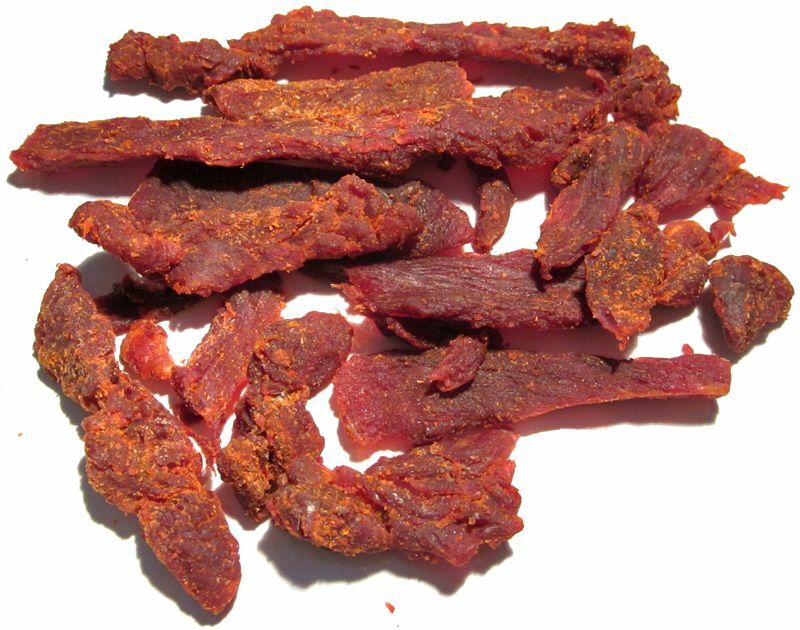 Interestingly enough, Uncle Mike's Original beef jerky seems to offer a barbecue seasoning flavor, with more spiciness, and more natural meat flavors, but without the heavy sweetness. I think the Original actually gives out a better overall flavor for someone seeking a barbecue-like flavor. But if you like sweeter jerky, with less saltiness, this Barbecue variety is a better choice. It has the same meat consistency as Uncle Mike's other flavors. For my recommended beer pairing, I'd go with a lighter bodied beer with a sharper flavor. Try a simple IPA like the Stone IPA or the Sierra Nevada Torpedo.